Finding peace and respite when a loved one is sick or injured can seem impossible. When that loved one is a child, doing so becomes even more daunting. In an effort to offer families in these situations a reprieve, pediatric hospitals across the country incorporate healing elements into the design of their facilities, such as prayer rooms, animal therapy centers, and soothing art displays. Each of these amenities aims to provide comfort and compassionate care for young patients and their families. But after one of the country’s most elite children’s hospitals made the difficult decision to do away with its signature therapeutic space, a group of patient families, volunteers, staff, and visitors have come together to save Prouty Garden—a haven that, for generations, has been a savior for thousands during their most pressing days. 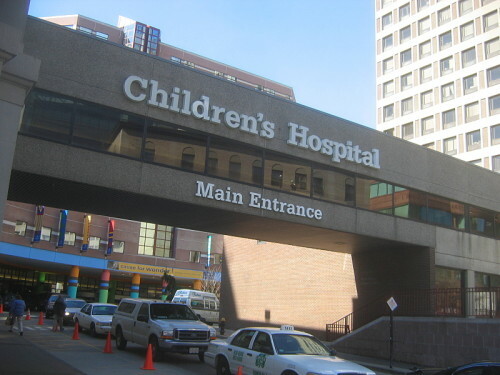 Boston Children’s Hospital, the number one children’s hospital in the United States as classified in U.S. News & World Report’s 2015-2016 rankings, is renowned for its leading cancer and heart centers. However, what many families associate with the 404-bed facility is not the hospital’s five-story frame or its state-of-the-art medical devices. Rather, where they find solace is Prouty Garden: a majestic redwood, encircled by a quaint fountain, various blooming flowers, and enchanting animal sculptures that replicate illustrations from a classic storybook. The garden, which bears the name of its donor, was endowed in 1965 in memory of Olive Higgins Prouty’s two daughters, whom she lost as children. It has stood prominently for decades, symbolizing what many believe to be Boston Children’s defining characteristics: persistence, resolve, and strength. Children receiving care at Boston Children’s who are well enough to leave their rooms find moments of freedom in the open space, a feeling not taken for granted when confined to a hospital room. Despite all that, in late 2014, hospital leadership announced that the tree and the garden it has made home would stand no longer and instead would be the future site of a historic $1.5 billion capital project. Although the hospital’s expansion is warranted (the capital project includes plans for a neonatal intensive care unit and additional single-patient rooms for children with uncertain immune systems), the demolishing of Prouty as a tradeoff is seen as less so. The hospital’s plans to build over the sacred sanctuary are providing those who have personally benefitted from the serene oasis with anything but peace. In fact, since Children’s announcement, an impassioned group of volunteers has established Save the Prouty Garden, whose mission is to petition hospital administration and secure funds to save the healing landscape from being destroyed. Bands of supporters have joined the conversation, urging Boston Children’s to seek alternative options for its expansion and noting that spaces like Prouty Garden, which has won national acclaim, are essential in the healing process. More than 220 pages documenting firsthand accounts of how the Prouty Garden has provided welcomed comfort in an otherwise uncomfortable environment are published on Change.org. Boston Children’s has responded to Prouty advocates saying that they are left with no choice but to expand over the garden due to all other building sites being unworkable. Undoubtedly, Boston Children’s most urgent need is to continue to provide top-tier pediatric care, which ultimately means creating the space necessary to treat sick and injured children. But several other issues are at play here. At what point is one component of an organization’s mission sacrificed for another? Prouty, and other healing spaces like it, are integral to the concept of compassionate care. Of course, patient rooms and other care areas are critical factors, too. Then, there’s the issue of Mrs. Prouty’s intentions as a donor. At the entrance of Prouty Garden sits a plaque memorializing Olive Prouty’s daughters, Anne and Olivia, keeping a promise to the family that the garden would serve for the enjoyment of children at the hospital, forever. Does “in perpetuity” really only mean “until it doesn’t work for us anymore”? Can Child Protective Services Preserve Families—And Not Break Them Apart? Can Child Protective Services truly protect children? A nonprofit program is seeking to change how government child protective services interact with families.